Yoo hoo!! Kitty lovers!! I wanted to share this freebie with you in case you were interested. Your furry little friends love freebies too so don't miss out on this one. 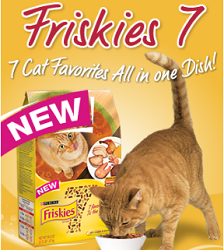 :) Request a FREE Purina Friskies 7 Cat Food Sample and just make sure you allow 4-6 weeks for delivery. Enjoy!